CRÉMAZIE, OCTAVE (baptized Claude-Joseph-Olivier), bookseller, writer, and poet; b. 16 April 1827 at Quebec, 11th child of Jacques Crémazie and Marie-Anne Miville; d. 16 Jan. 1879 at Le Havre, France. Of the 12 children born to Octave Crémazie’s parents, eight died in infancy, so that Octave, the youngest of those who survived, spent his early years in the company of three brothers: Jacques, Joseph, and Louis. 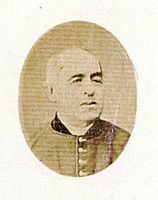 At the seminary of Quebec, where he was admitted as a day-pupil in 1836, Octave, under the influence of Abbé John Holmes*, acquired a liking for literature. 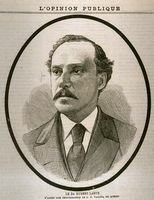 Holmes introduced him particularly to the French romantics, who were subsequently a predominant influence on the poet, as the style of his poems shows and as he himself states. Musset and Lamartine were soon his literary gods, together with the Victor Hugo of the period prior to 1850. 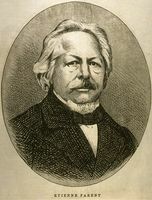 When Octave had finished his studies in 1844, he went into partnership with his brother Joseph at the head of a small bookshop, which had been established in 1833, and which thenceforth bore the sign “J. et O. Crémazie.” More venturesome than his elder brother, Octave worked to develop the business; in 1847 it was installed at 12 Rue de la Fabrique, and soon became one of the most important centres of French culture and refinement in Quebec City. 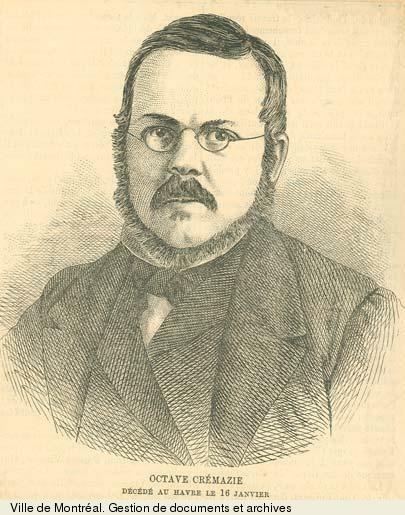 Crémazie, a great reader, the first to use the classical and modern books he sold, quickly acquired a reputation as an intellectual and scholar. 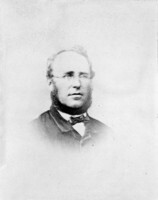 Thus on 2 Dec. 1847, at the age of 20, his name appeared among the founders at Quebec of the Institut Canadien, in which he subsequently held various positions on the governing body, including that of president in 1857–58. On the other hand, the company of ladies did not interest him; he was even perhaps a bit of a misogynist. The question of marriage was one he never entertained. As 1860 approached, the back of the Crémazie bookstore became a kind of club, where those who took part in the literary movement later known under the rather too formal title of the Quebec school dropped in and sometimes assembled. Chance brought together there Étienne Parent, François-Xavier Garneau*, Abbé Jean-Baptiste-Antoine Ferland*, Pierre-Joseph-Olivier Chauveau*, Joseph-Charles Taché*, Antoine Gérin-Lajoie*, Abbé Henri-Raymond Casgrain*, François-Alexandre-Hubert La Rue*, Alfred Garneau, Léon-Pamphile Le May*, Louis-Honoré Fréchette*, and a number of others, all friends of books and of Crémazie. It was the initiative of some members of this group that brought about the launching of two literary magazines Les Soirées canadiennes and Le Foyer canadien. To enhance the quality of his commercial imports, and no doubt also through a desire to go to the sources of culture, Crémazie felt a need to travel to France himself. He made his first trip at the end of 1850 and stayed the whole month of January 1851 in Paris, and he apparently returned there each year from 1853 to 1860. 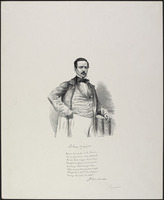 Even when his bookshop was growing in importance and approaching its zenith, and at the same time his popularity as a poet was becoming established, during the years 1855–57 and after, Crémazie had not changed his reserved and somewhat austere habits. At Quebec, where success seemed to smile on his every undertaking, people remarked on his modesty. But in Paris he appeared to be quite a different person. Perhaps despite himself, he played the comedy of the rich man of the world, so much so that he literally took leave of his senses. To maintain this absurd reputation, he placed extravagant orders with his suppliers for goods as costly as they were unusual: books, of course, of all kinds and prices, but also wines, cheeses, toys, religious objects, work boxes, and even umbrellas. A number of these articles, unsaleable because they were so expensive, could not even be displayed, for want of space. 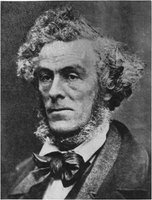 Having been so happy on each of his preceding voyages, finding in France as it were the ideal country, the source and model of his cherished Canada, Crémazie lived all the more wretchedly when he saw himself stranded there as an exile and separated completely from his own country. He entered France with his health already impaired by the nightmare years he had endured. Despite the help and affection he received constantly from a few French friends – in particular the Bossange family – he fell prey to sickness, poverty, solitude, and boredom, and was reduced to complete apathy toward poetic creation. The modest position he held in the business house of Hector Bossange, then in the shipping agency of Gustave Bossange, required him to live in turn in Paris, Bordeaux, and Le Havre. 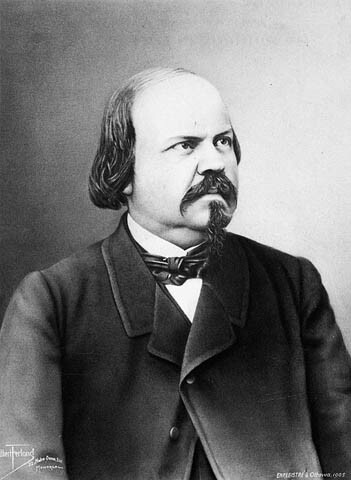 In 1870–71, during the Franco-Prussian War, he experienced the siege of Paris, and he made a detailed account of it in the form of a diary; during the Commune he was at Orléans. 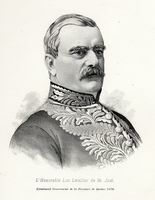 Except during the few weeks he spent in the company of his friend Abbé Casgrain, in 1873–74, and the short visits he received from the occasional Canadian traveller, Crémazie’s contacts with his native land were maintained through correspondence with his mother and brothers, or, through the intermediary of his family, with a handful of old friends. 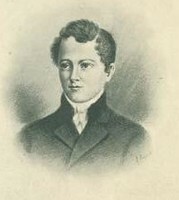 Although he was the sole author of his misfortune, his reputation among his compatriots never lost its lustre. 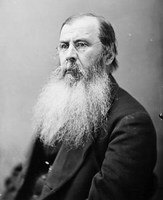 In 1862, at the very time when he disappeared from the local scene, he was at the height of his glory in Quebec as a poet. Les Soirées canadiennes had just published, at the end of October, the first part of a long poem entitled Promenade de trois morts, and promised for the next number a sequel, which was always hoped for and never written. The bankruptcy of the bookshop and the loss of the poet were a veritable thunder-clap in the Quebec sky. However guilty he might be, Crémazie, in the eyes of the public, appeared rather as an unfortunate victim. During the proceedings of 1864 he was never directly attacked. 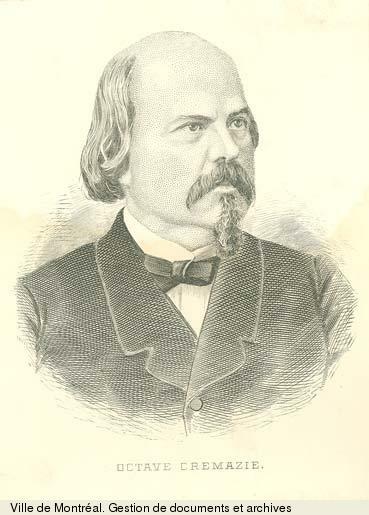 The tendentious pamphlet prepared by Louis-Michel Darveau which was published at that time, called Cause célèbre; procès de J.-R. Healey, en juillet 1864 . . . affaire Crémazie, questioned not the conduct of the poet but that of his alleged accomplices. In 1868, 75 prominent ecclesiastics and laymen addressed a petition to the Canadian government requesting royal pardon for Crémazie; from 1869 to 1872 a committee was engaged in seeking funds to pay off the exile’s debts. But all these steps were futile, either because of the inextricable disorder in which Crémazie had kept his affairs, or because of the fatal powerlessness of the law: not only was the royal pardon not necessary, but it was legally impossible, for no proceedings had been instituted against the poet. 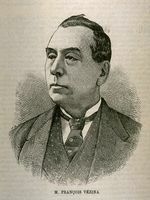 Other efforts – those of Luc Letellier* de Saint-Just in 1874–75 and Gédéon Ouimet* in 1877 – not to repatriate Crémazie but to provide him with material assistance on a proper scale – could not be given concrete form because of the accidents of political life. Fate willed both that the poet should be the object of national veneration and that he should lead a tragic existence until the end. In profound isolation, after more than 16 years of exile, he died at Le Havre, and was buried in the cemetery of Ingouville, where there exists no trace even of his remains. For a century Octave Crémazie’s fame has been interpreted in diverse ways, but it has known no decline. His contemporaries and the generations following have long continued to admire and extol some of his ringing stanzas. But for the man of today, touched more by the exemplary misfortune of the poet and by the weaknesses of work brutally interrupted at a time when it should have begun to emerge from its stumbling beginnings, Crémazie is pre-eminently the literary symbol of French Canadian estrangement. Whatever may be the variety and sometimes the exoticism of the subjects with which chance or circumstance inspired him, the basic incentive behind Crémazie’s poetic writings is the expression of a certain national identity. To this is due the fact that he is considered the sonorous echo of his people. Indeed his most justly famous poems belong in a characteristic fashion to what the critic Gilles Marcotte calls the poetry of exile. Exile in time, for the poet, unable to accept fully the material conditions of a thankless, disappointing age, cultivates a longing for a glorious past, irretrievably gone. Like his Vieux soldat canadien, Crémazie compared “the happiness of yesteryear with the sorrows of today.” He exclaimed: “Who will give us back that heroic age?” Exile also in space, for the spiritual country is France, with which one vainly tries to identify oneself through the bookish, poorly assimilated image one has of it. Like his hero in the Drapeau de Carillon, “he was exiled in his own native land.” The Canadian reality, even the landscape, is described by means of commonplaces, in tones that betoken artificiality and contrivance. Thus, in this country where two centuries have established them, Crémazie and the Canadien of whom he is the voice lead only an illusory existence: their soul is elsewhere. It is therefore not surprising that the Promenade de trois morts, the longest and most original – although unfinished – poem of Crémazie should concern itself in morbid complacency with a macabre and tormenting obsession for death. With an expressive sincerity, and probably without realizing it, the poet grasps only the dark side of life or shadows that cannot endure. Certainly the tribulations Crémazie experienced in his last years at Quebec must have aggravated his fundamental melancholia. He exercised his ingenuity to banish from his poetry any direct allusion to his personal sufferings – yet they are nevertheless to be found there. In any case his poems are truly a mirror held up to the generations who have recognized themselves in them. When he was in his beloved France, uprooted and withdrawn into his private drama, he wrote no more verses. On the other hand, his work in prose, fragmentary though it is, reveals an authentic writer. The Journal du siège de Paris is a spontaneous document of great psychological value, showing the quality of soul and intelligence of the person who kept it during those historic months. Without affectation – for these 200 pages were not in any way destined for publication – Crémazie succeeds in communicating in the most concrete and convincing fashion the distress and privations that a simple, lucid, and magnanimous man experienced in a daily tragedy. Furthermore, his correspondence with his family, which is only partially known and which one hopes will some day be discovered in its entirety, is direct, natural, moving, and touching. 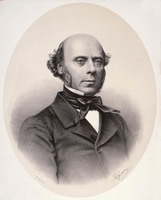 Finally, in his letters to Abbé Casgrain, Crémazie, engaging in lively and candid criticism of himself and others, or airing his views in random fashion on the cultural problems of his country, displayed a literary sensitivity unlike any other to be found in French Canada in the whole of the 19th century. Thus Crémazie, a mythical figure among poets, remains for posterity a skilful prose-writer, living still despite his place in the span of time. 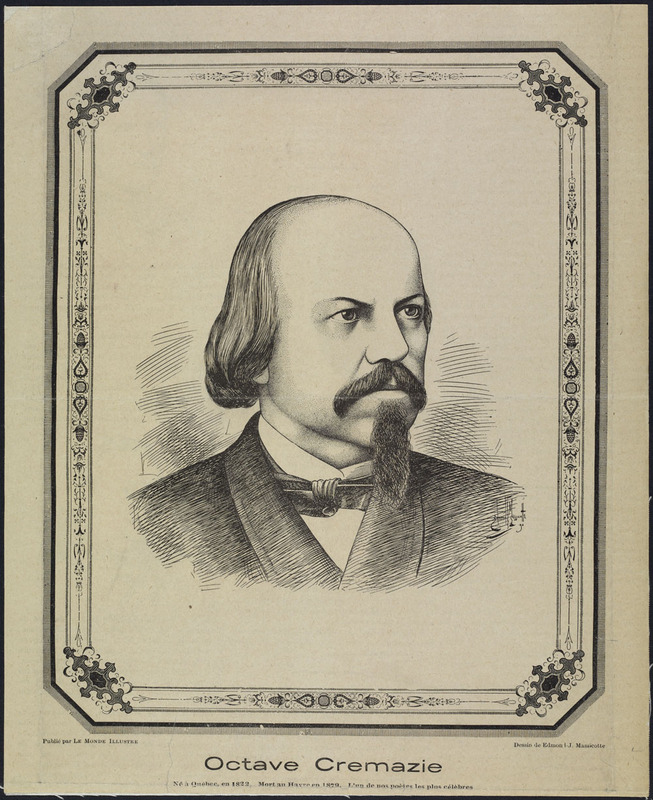 [Crémazie’s poems, which first appeared in newspapers or as leaflets, were collected in two publications by the efforts of Abbé H.-R. Casgrain: 25 poems appear in the 2nd volume of La littérature canadienne de 1850 à 1860, publiée par la direction du “Foyer canadien” (2v., Québec, 1863–64), 11, 9–122; and in the Œuvres complètes de Octave Crémazie publiées sous le patronage de l’Institut canadien de Québec (Montréal, 1882). The latter, prepared by Casgrain in collaboration with H.-J.-J.-B. Chouinard, does not include all Crémazie’s poems. In fact, P.-G. Roy*, in A propos de Crémazie (Québec, 1945), lists the titles and publication data of four pieces which appeared in newspapers and are not in La littérature canadienne or Œuvres complètes. In addition, Roy reproduces in full Le premier de l’an 1849, the first poem Crémazie published. 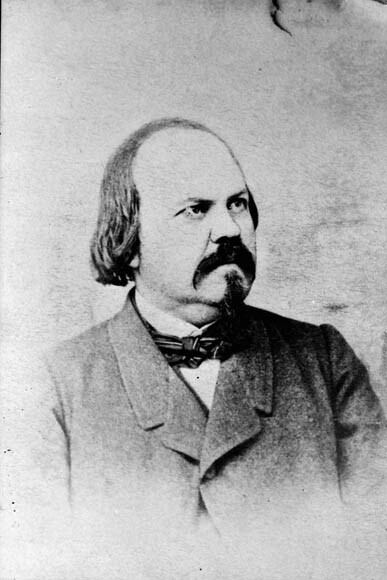 To this list must be added the poem which serves as an epigraph to Les Anciens Canadiens by Philippe Aubert de Gaspé and which Casgrain maintains was written by Crémazie. 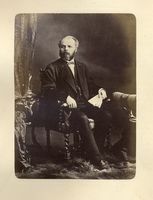 [H.-R. Casgrain], Œuvres complètes de l’abbé H.-R. Casgrain (4v., Montréal, 1896), I, 353–75. 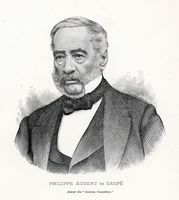 Cause célèbre; procès de J.-R. Healey, en juillet 1864, sous la présidence de l’hon. juge Drummond; affaire Crémazie ([Québec, 1864]). 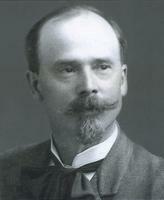 H.-R. Casgrain, Octave Crémazie (Bibliothèque canadienne, Collection Montcalm, Montréal, 1912). Michel Dassonville, Crémazie (Classiques canadiens, 6, Montréal et Paris, 1956). Gilles Marcotte, Une littérature qui se fait, essais critiques sur la littérature canadienne-française (Collection Constantes, 2, Montréal, 1962), 65–70, 71–83. Séraphin Marion, Les lettres canadiennes d’autrefois (9v., Hull et Ottawa, 1939–58), V. Fernand Rinfret, Études sur la littérature canadienne-française; première série, les poètes: Octave Crémazie (Saint-Jérôme, Qué., 1906). 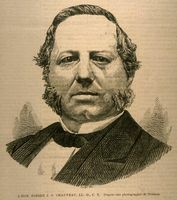 H.-R. Casgrain, “Le mouvement littéraire en Canada,” Le Foyer canadien, recueil littéraire et historique (Québec), IV (1866), 1–31. Jeanne Le Ber, “L’amitié littéraire de Crémazie et de Casgrain,” Archives des lettres canadiennes (Ottawa), I (1961), 184–208. Réjean Robidoux, “Les Soirées canadiennes et le Foyer Canadien dans le mouvement littéraire québécois de 1860, étude d’histoire littéraire,” Revue de l’université d’Ottawa, XXVIII (1958), 411–52. G.-A. Vachon, “L’ère du silence et l’âge de la parole,” Études françaises, revue des lettres françaises et canadiennes-françaises (Montréal), III (1967), 309–21. 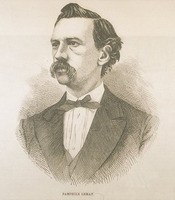 Réjean Robidoux, “CRÉMAZIE, OCTAVE,” in Dictionary of Canadian Biography, vol. 10, University of Toronto/Université Laval, 2003–, accessed April 24, 2019, http://www.biographi.ca/en/bio/cremazie_octave_10E.html.